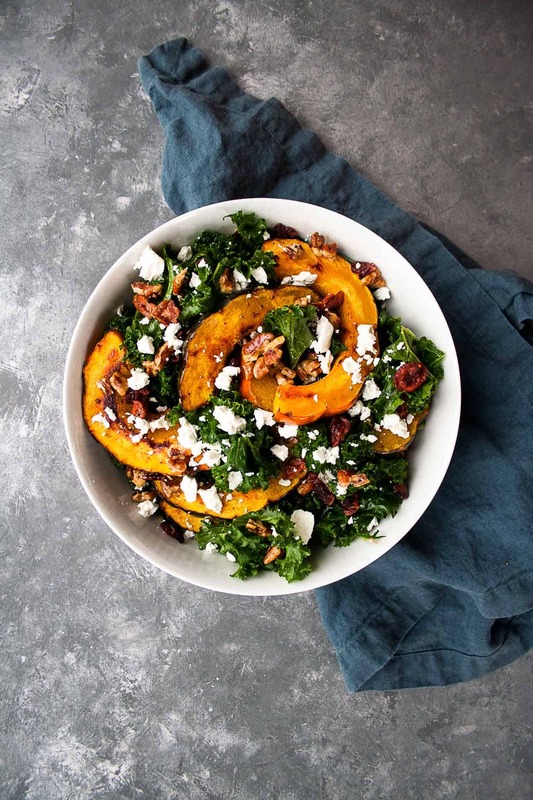 All of the flavors of fall wrapped up into one Kale Salad with Acorn Squash – topped off with goat cheese, dried cranberries, and candied pecans! I woke up yesterday morning to a text message from my uncle asking me about Thanksgiving. He is a PHENOMENAL cook – the kind that bakes bread from scratch every single week, the kind that started brewing booch way before I did, and the kind that is incredibly aware and attuned to his niece’s food allergies. He is actually the best. But furreal. A GF and DF pumpkin pie?! I’m already drooling just thinking about it. But I’m really most excited for that stuffing. Over the last few years, my feelings towards stuffing changed from ‘couldn’t care less’ to ‘gimme ALL of it’. And I was devastated thinking that this would be my first Thanksgiving without it… until now. 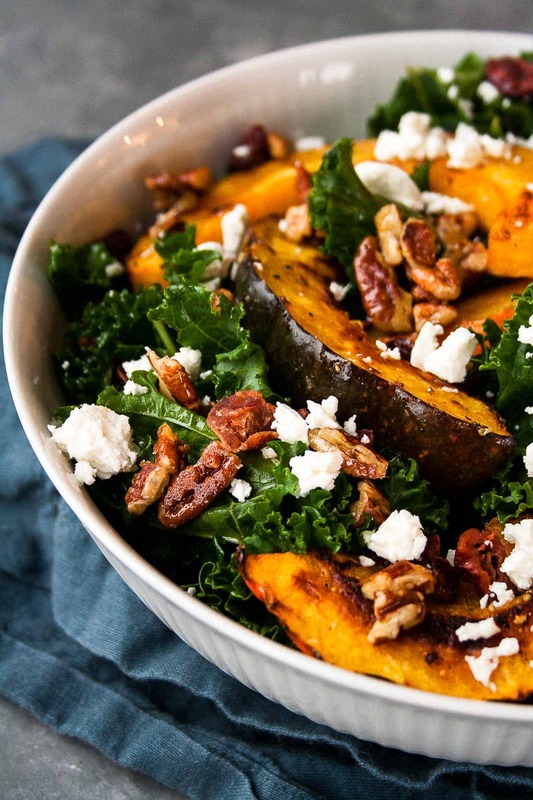 I am bringing this Kale Salad with Acorn Squash to Thanksgiving! And I am seriously jazzed about it. This salad has all of the flavors of fall tossed together in one bowl of goodness. Hearty kale in a balsamic vinaigrette. I’ll be back on Thursday with an allergy friendly dessert that needs to be on your Thanksgiving table! 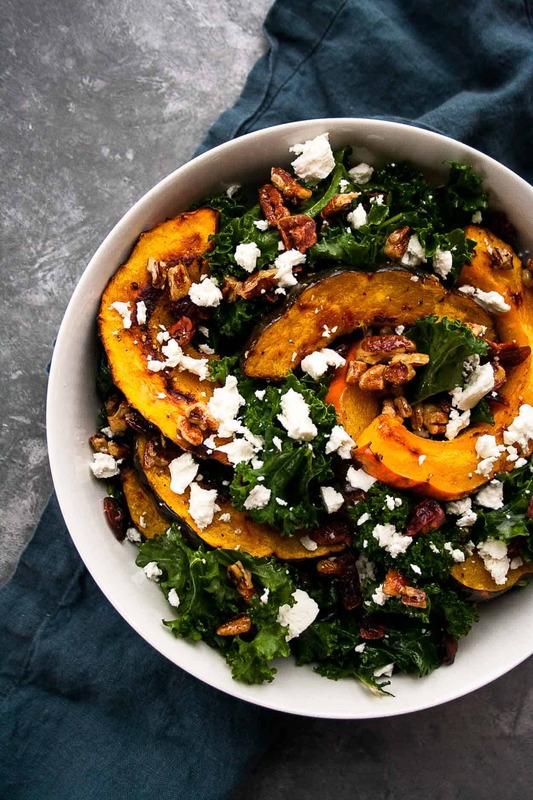 If you make this Kale Salad with Acorn Squash, post a picture on social media using the hashtag #imhungrybynature for a chance to be featured! Cut the acorn squash in half, scooping out seeds. Cut each half into 1/2 inch slices. Drizzle with olive oil, salt and pepper. Roast for 40 minutes, flipping squash halfway through. While the squash is roasting, prepare the salad. Wash and dry kale and tear into bite size pieces. Drizzle kale with a balsamic vinaigrette and massage. Heat a skillet over medium-low and add pecans. Toast pecans until they come fragrant, about 5 minutes. Add maple syrup to pecans, making sure they are coated. Turn the heat off after another minute and allow the pecans to cool. 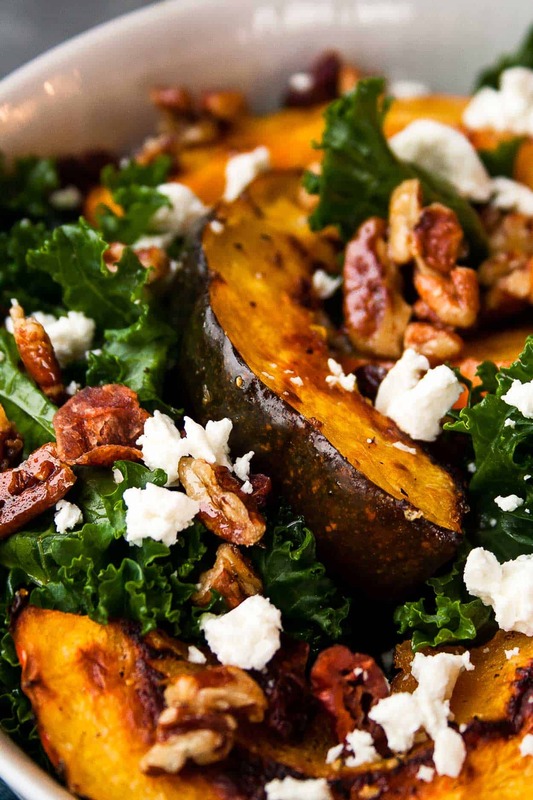 Add roasted squash, candied pecans, dried cranberries, and crumbled goat cheese to kale. Toss to combine! Pin this and save it for Thanksgiving! Cannot wait to taste this delicious salad at Thanksgiving! We are the luckiest recipients of all, getting to be at the table with such fine cooks… can’t wait to see you, celebrate family and consume these incredible morsels! XO, A.
I’ve never eaten squash with the skin on! What taste and texture does it have post-roast? Oh I love it! It’s really thin and kinda crispy on the edges. Just make sure you wash it really well before you roast and you should be good to go! a) this looks freaking amazing! b) I love that backdrop you used, it’s spectacular! c) can i have both you and your uncle round for thanksgiving!? holy moly that menu sounds amazing! this salad looks absolutely perfect too, I have found a new love in acorn squash! Thank you Georgie! This backdrop is the stormy silver from Erickson’s and I love it! And my uncle is honestly the most amazing human being and best cook. Thank you!